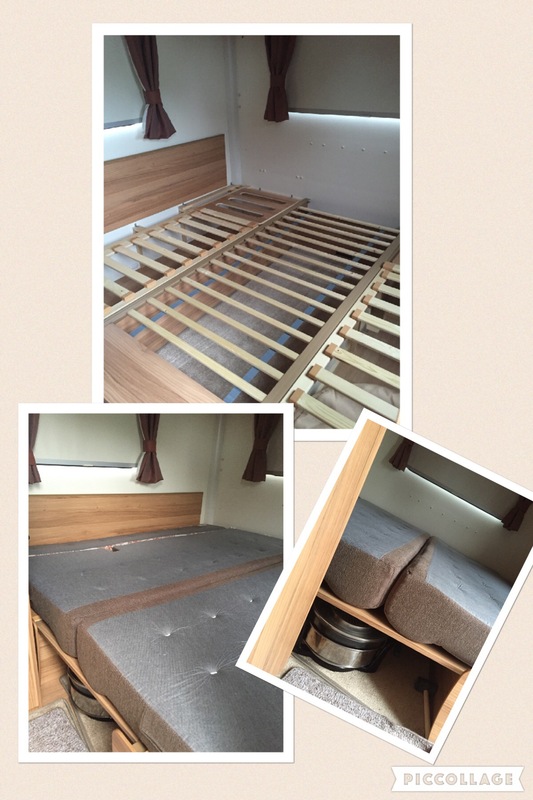 Have you ever woken from your caravan slumbers with a bad back? “Oh Yes” I hear you all responding. No doubt my ageing bones have some say in this, but my bed at home doesn’t quite leave me with that ‘just run over by a bus’ feeling that I get from the caravan bed. 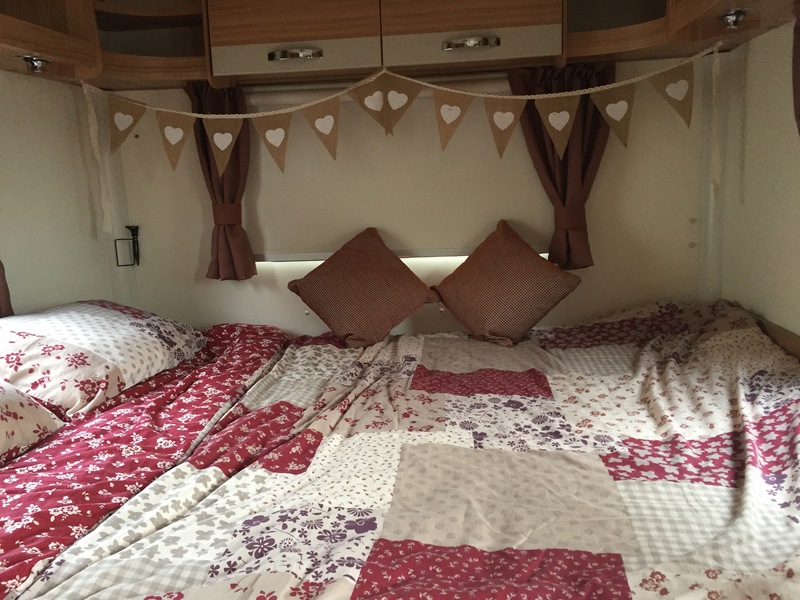 Depending on your caravan lay-out and preferred sleeping arrangements you may be affected slightly less than us. Fixed beds and Single beds may help but we have an end dinette lay-out and also still like to ‘hold hands’ every now and then, I use the term ‘hold hands’ to protect our children from unthinkable thoughts. This means we have to play the cushion tetris game after pulling various frames and bits of wood into place first. Luckily, for us, we keep this in place permanently as we have a double dinette, in smaller vans this is a daily activity to convert the living space. So why the bad back? There are two elements at play, the mattress and the base. Mattress choices are very much down to personal preference, if you only have one living area you are very much restricted to the seat cushions and maybe a thin mattress topper is your only ‘wiggle’ room of improvement. Fixed beds have the advantage of a ‘proper’ mattresses, however, they are often funny shapes with cut off corners meaning ‘off the shelf’ mattresses are not common and force you towards specialist suppliers if change is desired. In this respect, we are fortunate, once we convert the rear dinette we are left with a very large rectangular area large enough for a standard king size mattress or for a custom size mattress, we are currently considering potential mattress choices and will review this further in a future blog. When you buy a mattress for your house you will generally find there is a recommended minimum distance for the supporting bed slats. Forget that, in most caravans that is nowhere near and the supply of fresh air far outweighs the supply of support. Before you think it, I know, weight is all important. The biggest issue for us, however, is that once we have slid out the various supports our base is about as level as the average country lane in Surrey, where they have enough holes to fill not just The Albert Hall but the O2 Arena too. The ‘very thin’ slats under the seats sit one inch proud of the frame and the ‘even thinner’ slats that slide out to fill the gap between the seats sit about one inch lower than the frame. The cushion backrests drop into the gap but are slightly softer that the seat cushions so the end result is that we sleep with our ars bums lower than our heads and feet, or we try to put the thicker knee rolls to the centre but end up with our bu arses up in the air. A radical solution followed. The caravan will never ever be a 5 berth again, but there are only 2 of us. We have finally realised there is no point having something not fit for purpose just to satisfy a ‘resale value’ mentality, what will be will be. Bunk Bed – Gone, Dining Table – Gone, Sliding Slats – Gone, Seat Frames – Gone. 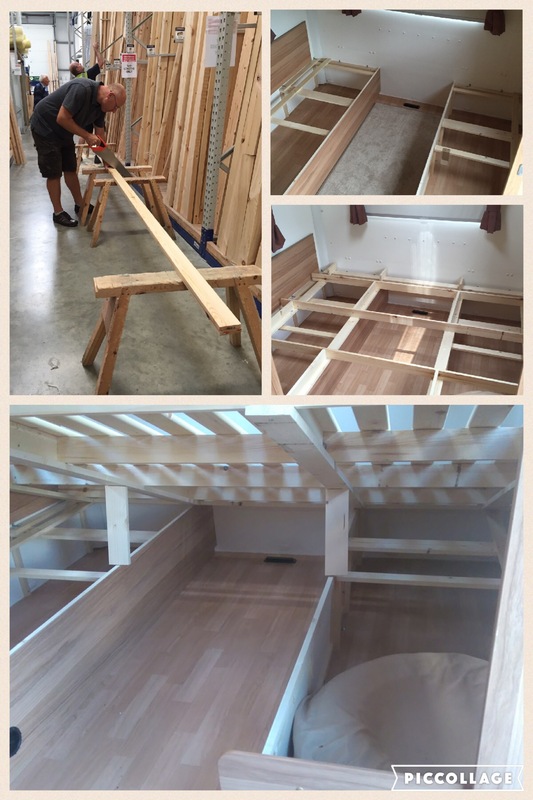 In their place, Proper “Hinged” wooden bed frame, Proper Bed Slats and Gas Struts to support whole structure. Outbound Weight 31.7kg. Inbound Weight 31.6kg. All weights calculated using the following technical formula. During construction, not one screw has gone into the walls or the floor, everything is attached or rests on the existing framework, all the cheap plastic runners have gone, the source of creaking sounds, so we can now ‘hold hands’ in peace too and the gas struts allow us to easily reach all the floor/underbed storage areas now. Total cost, about £180, and ironically, a bad back. We have only slept about five times on the new set up but there is a very notable difference, the addition of a real mattress can only add to the comfort, so now, for the sake of my joints, I just need to stop getting older. We did the same in our previous Bailey pageant. Though in a more basic way. Just need a mattress now! Frame; Planed Timber 18mm x 70mm. I purchase 8 lengths x 2400mm but had left overs. B&Q approx £50. Gas Struts; GSV10-400 Adjustable Force Gas Strut from SGS Engineering in Derby, very helpful on telephone. They are very powerful and you let gas out using Allen Key until you get desired strength. Approx £100 with all fittings. I used ball sockets on struts but various other end fixings available. 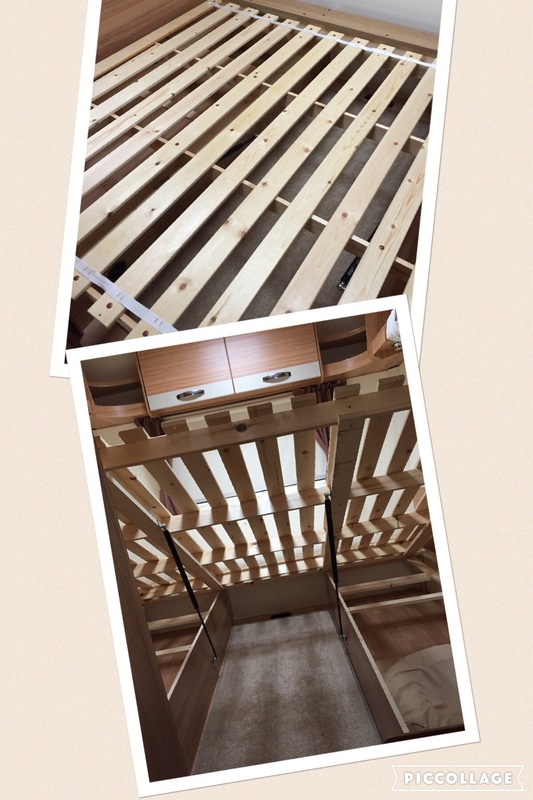 Bed Slats; I opted for 16 Pine BedSlat Pack (50mm gap) with total length 1890mm. BedSlats.co.uk approx £60. So my total cost is slightly higher than first calculated.